Since different exchanges support different alt coins I ended up opening accounts in PoloniEx, Bittrex and Bitfinex. In addition to these I also opened account in https://liqui.io/ for some altcoins and https://www.binance.com for storing NEO. I have been a fan of Cointracker Porfolio since the day I purchased the licence. But when ANS rebranded as NEO coin tracker started referencing a different coin and it led to confusion for me. I was just hoping that it would have been great if there was an option to rename the coin. I was very sceptical thinking that no portfolio would have adopted the change so quickly. But when I visited my portfolio support form I was surprised to see the link "Issue with ANS and NEO". Looks like lot of people were having issues like me and Cointracking had already figured that out. 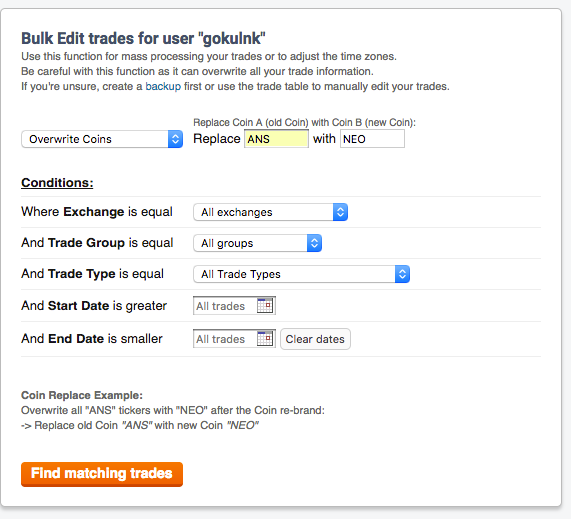 In the bulk edit option select Overwrite Coins from the first dropdown. From the "Conditions", select the conditions that match your criteria. It will find all matching entries and then ask you for a confirmation for replacing. Now your portfolio is upto date and you can track it as usual.